This website has just over 20,000 hosts and the average number of online models at any given time is 400 or so. That's more than plenty to choose from if you ask me. Officially Private Chats on Sexier.com start at 0.98 credits per minute, which is already pretty low, but you have ways of lowering this price even further. Check out what I write under the membership section and you'll understand that live chats can begin as low as $0.20 a minute. Yep. I am not making this up. See for yourself. Keep in mind that there are more expensive webcam models on the site as well though, so don't just start a private chat before making sure you know the price. Users that want to save some cash will appreciate the Happy Hour chat rooms. Their standard cost, even before additional member discounts, is only $0.88. Here are the current credit packages offered by Sexier.com. If you don't understand what the Miles are (and I am guessing you don't), let's just say that they are bonus points which later turn into benefits, and you can just scroll to the membership section for more info. 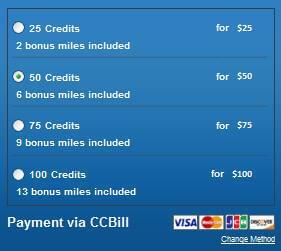 Notice that while the cost per credit remains constant, the number of miles grows more rapidly with bigger packages. This means that if you're going to buy 100 credits anyway, it is advisable to buy it in one bulk instead of in 2 packages of 50 credits or 4 packages of 25 credits each. The Frequent User Club - Users that buy enough credit are upgraded to advanced memberships for free and enjoy bigger discounts. Sexier.com has recently changes its membership options and they are now a tad more complex, but a lot more rewarding. How does it work, exactly? You get miles with every credit package you buy and when you accumulate a specific amount, you are upgraded to a higher level of membership. Users now don't need to pay for any type of membership (before you had VIP which cost you a monthly fee) and all members are rewarded just for staying loyal to the Site. That's a great thing, considering the rewards are price-discounts and cheaper than ever chats. Information Needed: Username, unique password, an email, a credit or a debit card. View pics and videos of the webcam performers. Assuming they have any. Not all do, but certainly the vast majority. Get busy chatting with the live hosts and after only a little while you'll have the 15 miles required to become a Silver member. Cost to Join: Free. Once you've collected 15 miles you'll become a Silver member automatically. Cost to Join: Free, but you need to collect 200 miles, which takes longer than collecting the 15 needed for Silver. Complimentary 100 credits as a welcoming gift to Gold. Pay 0.35 credits only per minute on Happy Hour chats. Loyalty pays off Big Time on Sexier.com and if you manage to stick around long enough, you will eventually become a Platinum member and win crazy benefits for your d3evotion. Cost to Join: Free, assuming you succeed in collecting 500 miles, which is a lot, but will eventually happen because the live show son this webcam site are simply superb. A welcoming gift to Platinum in form of 200 credits. WOW. Pay only 0.20 credits per minute during Happy Hour live chats. The Message Center - This platform provides user with a simple method of contacting models, scheduling shows and staying in touch. Reward program – every time you purchase credit with the site, Sexier.com will give you free additional credit as a way of showing you appreciation. The more you buy, the more free credit you get. Quick list – Click on the Quick List icon for every host you really like and she will automatically be added to a link where you can click to find her next time. The Frequent User Program – get points on your first time purchase of credits (the more you buy, the more points you get). The more points you have, the more benefits and discounts you'll get. Set the picture box to view your live chat at three different sizes, ranging from a quarter of the screen to a full screen. Zoom in and out and enjoy close up angle with the easy to use tabs. The home page of the site immediately breaks down hosts into many different categories even before you press or click on anything. You can immediately look for hosts through either live chat, most requested or most popular. Notice that under the categories, there is also a section called Most Requested, you know – just inc ase you don't know what you're looking for and need some ideas. The Sort tool at the bottom of the video chat page is especially useful and ill allow you to choose the webcam partner you want from a large set of criteria. Another enjoyable way to search for models, if you want to stick to best-quality performers but don't really know much about the site, is to use the Top Cam Models list. There you will find all the highest ranking performers as well as their specific rating and links to bio pages. You can contact customer service through email 24 hours a day, 7 days a week and you get a response quickly. Just click the Contact Us link at the bottom of every webpage and you will be directed on how to contact the department. There are FAQs on Sexier, but they are far from being great. There are only like 8 questions on this page and they are so general that I doubt it if any user finds them useful. Sexier.com is only available in English. However, you can find hosts that speak 27 different languages on the site. To find specific languages, just use the Language Search bar located at the top of the main search page and select the language you like. Sexier.com has one of the larger selections of celebrity hosts to provide you with amazing private shows. Non famous hosts are usually also be great, but some of the celebrity hosts have such experience and talent, that the other performers are just no match for. Also, the website offers some really good discounts, so your money goes a long way. The webcam models here are very attentive and the platform is very user-friendly. There is nothing really unique about the site to make it stand out among the hundreds of webcam chat sites that are on the net today. Plus the celebrity hosts which are available do not work on a set schedule, so you just have to hope you get lucky and they happen to be online when you are. Rates for a private chat are average, but you can lower the cost significantly with special discounts and member benefits, so you get a great deal for your money. The interface technology the site uses is more advanced, which makes browsing the site fun and enjoyable. In the end, it’s worth registering just to be able to interact with the celebrity hosts who are on the site and give amazing private shows.